If you’ve spent much time driving around suburban neighborhoods or walking the dog on countless sidewalks, then you have no doubt noticed a wide array of path lighting options in just about every shape and size imaginable. With their characteristic “hat on a stick” configuration, they have served the typical function of casting lighting onto sidewalks, steps, driveways and flower beds for decades. Their look and function have become so commonplace in our residential neighborhoods, that it is generally the first thing that homeowners and contractors consider, to perform these vital, safety related functions after the sun goes down. As a professional lighting design company, we strive to produce clean lighting scenes where the landscape and outdoor structures are the star of the show. In other words, that means we prefer to see the “effect” of the lighting and not the “source” of it. 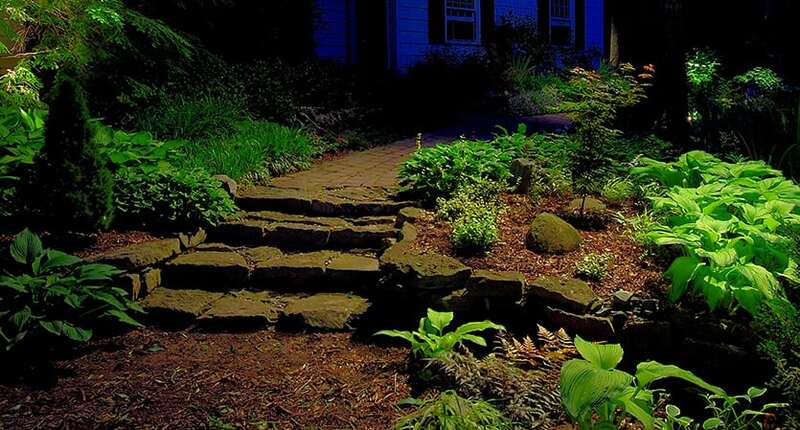 Pathway lights (when used in great numbers and density) can often create a lot of visual clutter and will detract from beautiful floral arrangements and landscape features, that should be the stars in our landscapes. Minimizing the clutter often presents a challenge when it comes to illuminating pathways and stairs, where a path light is sometimes the only option that can be used to directly illuminate these safety hazards. Many installers and homeowners reach for pathway lights first because it is the easiest and most obvious tool to get the job done; however, there is another way that is very often overlooked. Medium to large-sized trees on a property are a wonderful asset and afford the outdoor lighting designer with a good canvas to help paint in some pleasant lighting effects. Furthermore, if they are situated in just the right locations and of sufficient size and shape, will provide the lighting designer with adequate places to mount downward facing, directional spot lights. Imagine walking down a pathway lined with flowers of all shapes and colors and seeing them all softly bathed in a warm, gentle light from a source that has yet to be been discovered. Strategic down-lighting also affords the lighting designer a way to illuminate the hazard areas of pathways and elevation changes around a property in an elegant, yet effective way; thereby removing the need for the clutter of ground-based path lights. Contact your local Lighthouse Outdoor Lighting designer today to schedule a one-on-one personal consultation today, and see if strategic down-lighting is something that can be applied to your home and property.